Endometrial ablation is a type of medical process which facilitates the removal of endometrium from the uterine wall. Such process helps in the destruction of such thin layers to stop abnormal heavy uterine bleeding. Endometrial ablation procedure is highly recommended when the uterine bleeding is no longer controlled by any means of medications. Growing demand for minimally invasive surgical procedures, and burgeoning population suffering from abnormal vaginal bleeding are the major factors fueling growth in the global endometrial ablation market. Growing incidences of pelvic inflammatory disease and endometriosis, rising cases of various gynecological disorders, and increasing adoption of endometrial ablation devices are also boosting the global endometrial ablation market. Apart from these, rapid technological advancements, improving standard of living, increasing demand for effective treatment of gynecological disorders are also propelling expansion in the global endometrial ablation market. According to experts, the endometrial ablation market is anticipated to register revenue worth of US$1.3 bn by 2024 end. The growth is prophesized to occur at a promising CAGR of 5.50% during the assessment period from 2016 to 2024. Endometrial ablation procedures help in curing various gynecological disorders such as abnormal vaginal bleeding, and POCD or polycystic ovarian disease in women. The market is mainly segmented on the basis of device type, end-users, and region. From the perspective of device type, the global endometrial ablation market is segmented into electrical ablation, cryoablation, hysteroscopy devices, hydrothermal ablation, radiofrequency endometrial ablation, microwave endometrial ablation, thermal balloon ablation, laser ablation, and ultrasound transducers. Among these segments, radiofrequency endometrial ablation is anticipated to showcase fantastic expansion in the coming years, especially during the assessment period – 2016 to 2024. This is due to the short surgical procedures, ease of usage, and cost-efficiency in using the radiofrequency endometrial ablation device. However, apart from radiofrequency endometrial ablation device, microwave endometrial ablation is the next segment to witness highest penetration, owing to its several benefits in endometrial ablation procedures. In terms of end-user, the global endometrial ablation is divided into following segments – clinics, hospitals, and ambulatory surgical centers. Among these end-users, the clinic segment is expected to account for the largest share in the global endometrial ablation market. This is because of the rapid advancements in endometrial ablation techniques which do not require large space such as hospitals. Thus, the devices can be used in the clinics. However, the ambulatory surgical clinics is expected to become the next dominating segment during the forecast period due to their significant uptake of various types of endometrial ablation devices along with rising number of centers, convenient environment, and cost-effective services. On the regional front, the global endometrial ablation market is segmented into North America, the Middle East and Africa, Asia Pacific, Latin America, and Europe. 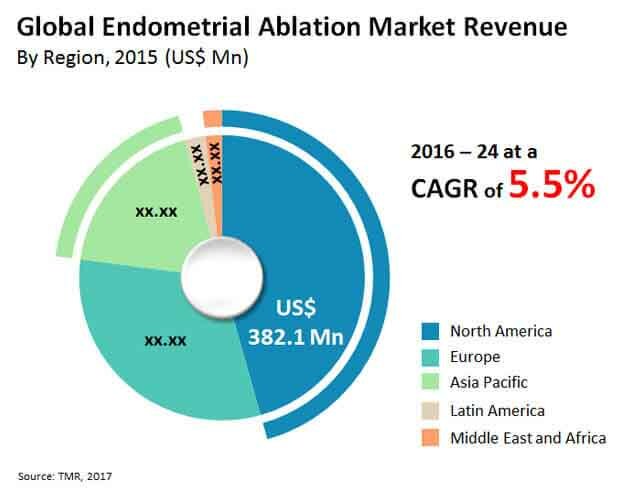 Among this, North America dominated the global endometrial ablation market with a lion’s share and is expected to remain dominant with a share of nearly 44% during the forecast period. On the other hand, Asia Pacific is also anticipated to provide lucrative opportunities to the growth of the market over the forthcoming years. This is because of the rising gynecological disorders and high unmet medical needs in the region. Some of the prominent players operating in the global endometrial ablation market include Cooper surgical, Medtronic Plus., Minerva Surgical Inc., Olympus Corp., and Hologic Corp. These players are expanding their product portfolio to gain a competitive edge in the market. This report on the global endometrial ablation market analyzes the current and future prospects of the market. The report comprises an elaborate executive summary, including a market snapshot that provides overall information of various segments and sub-segments. A detailed qualitative analysis of factors responsible for driving and restraining market growth and future opportunities has been provided in the market overview section. This section of the report also includes market attractiveness analysis that provides a thorough analysis of the overall competitive scenario in the global endometrial ablation market. Market revenue in terms of US$ Mn for the period between 2014 and 2024 along with the compound annual growth rate (CAGR %) from 2016 to 2024 are provided for all the segments, considering 2015 as the base year. Market size estimations involved in-depth study of services and product features of different types of services. Additionally, market related factors such as increasing preference for technologically advanced services, product innovation, and increasing prevalence of cancer and other chronic diseases in various geographies and historical year-on-year growth have been taken into consideration while estimating the market size. The report provides market size in terms of US$ Mn for each segment for the period from 2014 to 2024, considering the macro and micro environmental factors. Growth rates for each segment within the global endometrial ablation market have been determined after a thorough analysis of past trends, demographics, future trends, technological developments, and regulatory requirements. Based on devices type, the global endometrial ablation market has been segmented into – cryoablation electrical ablation, hydrothermal ablation, hysteroscopy devices, microwave endometrial ablation, radiofrequency endometrial ablation, thermal balloon ablation, others (ultrasound transducers, laser ablation, etc.). On the basis of end user, the market has been segmented hospitals, clinics, ambulatory surgical centers and others. Geographically, the global endometrial ablation market has been segmented into five regions: North America, Europe, Asia Pacific, Latin America, and Middle East & Africa. In addition, the regions have been further segmented by major countries from each region. These include the U.S., Canada, the U.K., Germany, France, Italy, Spain, China, Japan, India, Saudi Arabia, South Africa, Brazil, and Mexico. The report also profiles major players in the endometrial ablation market based on various attributes such as company overview, financial overview, SWOT analysis, key business strategies, product portfolio, and recent developments. Key companies profiled in the report include Boston Scientific Corporation, Hologic Corporation, Olympus Corporation, Minerva Surgical, Inc., Smith & Nephew, Plc., The Cooper Companies, Inc. (Cooper Surgical Inc.), KARL STORZ GmbH & Co. KG, Richard Wolf GmbH, Ethicon, Inc. (Johnson & Johnson), Medtronic plc and AngioDynamics Inc.